Island Sweet Skunk is a Sativa strain that has Canadian roots. It is a potent strain (Up to 19% THC) that smells and tastes exactly like its name suggests: sweet and skunky. Although the strain is known for its energetic effects, it can also be used for relieving anxiety, depression, nausea, and pain. 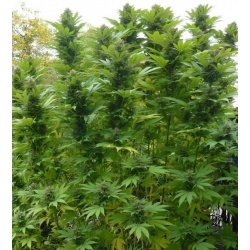 Island Sweet Skunk is also useful with nerve pain, migraines, arthritis and GI disorders. Winner of a Canadian award at the High Times Cannabis Cup, this cannabis strain is popular in British Columbia and Ontario, as well as Colorado and the Pacific Northwest. Island Sweet Skunk is a descendant of Skunk #1 that boosts energy and creativity but with a mellow body relaxing body effect. Flowering occurs in 7 to 8 weeks and the buds will have bright yellow-orange hairs. Heavy yielding with long spear-like buds. Sativa dominant strain with a sweat-inducing high.